Email selling has gotten more and more competitive over the last few years. With your prospective customers receiving 100+ cold emails a day, it’s harder than ever to cut through the noise. 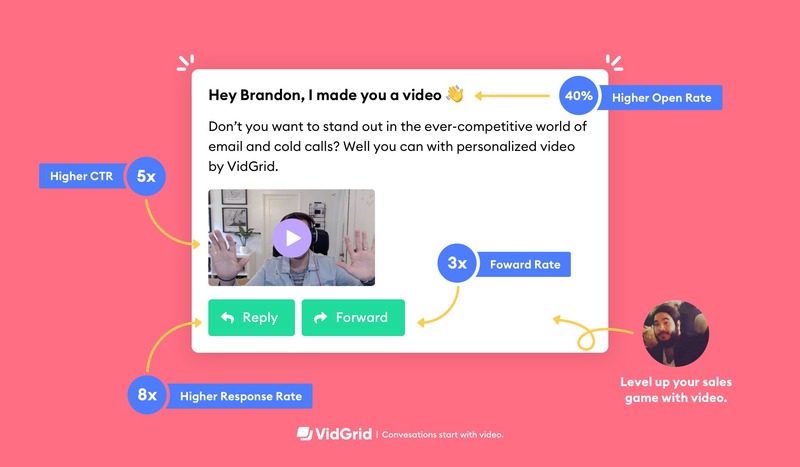 VidGrid offers email integrations for Google, Outlook, and SalesLoft so you can record, edit, send, and track videos right within the platforms you are already using. Simply add the integration to get started. Simply make the video within the VidGrid platform, and then copy and paste the video into your email draft. You might be thinking something along the lines of “(1) It’s impossible to ‘copy and paste’ videos, and (2) emailing out full video files seems like a horrible idea.” You are 100% correct. So, you really can email your “video” out through any video platform without worrying about sending out large files or triggering spam filters. Just click the “more” option under your video and select “Copy GIF.” You can now paste that GIF directly into email drafts. The email text should be short and sweet. You want to draw the focus to the video. If you give away too much in the text, they may not watch the video, and you lose the chance to build the face-to-face connection. As a [job title], I imagine you are focused on [goal]. I made this video to show you how [your company] can help you [achieve goal]. Are you interested in an introductory call? How does tomorrow afternoon look? (Also always remember to go through the Best Practices for Video Recording checklist before you hit that “record” button).